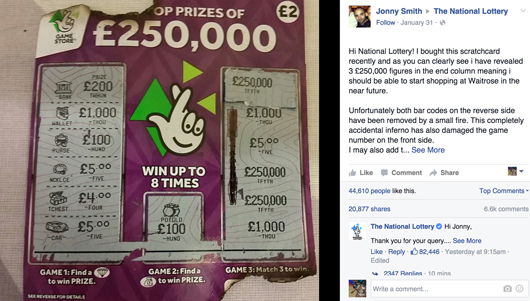 Feast your eyes on Mr Smith's faked attempt and The National Lottery's classic response. A man tried to fool the National Lottery into thinking he'd won £250,000 on a scratch card, but let's just say he wasn't fooling anybody. "Hi National Lottery! I bought this scratchcard recently and as you can clearly see i have revealed 3 £250,000 figures in the end column meaning i should be able to start shopping at Waitrose in the near future. "Unfortunately both bar codes on the reverse side have been removed by a small fire. This completely accidental inferno has also damaged the game number on the front side. I may also add that due to my clumsyness, in a completely seperate incident i have also spilt pen ink on the other identifying number in the game column Just my bloody luck eh!? "Just to conclude, if you dont mind sending me a direct message to confirm that this is a winner i would be more than happy to pass on my postal address so you can send me my winners cheque. "Thank you for your query. "We have investigated this image for you, we can tell that the 'small fire' that the scratchcard was involved with, was very selective and clearly didn't like the barcodes, we suggest that you completely fire proof your home to avoid such instances from happening again. "It may also be handy if you no longer use ink pens and buy pencils from now on to avoid another ink spillage. "Furthermore, looking at the image very closely it has come to our attention that the extra £250,000 on the top right hand corner has been placed carefully, however we recommend that you invest in some proper glue. "To conclude, we won't be sending you a direct message requesting your details as this won't be necessary, we would like to thank you for your time to contact us, we wish you every success in the future with our games - and maybe, just maybe one day you will be able to shop at Waitrose. "If you are unhappy with the outcome you can email us on: thisisnotawin@national-lottery.co.uk for further investigation. Looks like the Jonny's accepted it though, writing on his Facebook wall: "To summarise: I don't think i'm getting £250k."